—Back home by 10 p.m.! 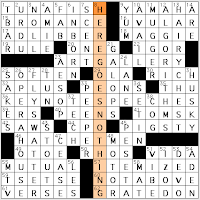 Liz Gorski's New York Times crossword, "Man of Many Words"
All right, there's nothing at all wrong with this puzzle, but the theme couldn't be more perfectly designed to leave me unmoved. JOHNNY MERCER songs? Ten of them? Luckily, they were clued with other contexts, because most of the songs are not ones I've heard of. Those circled letters from A to N make a connect-the-dots picture of a, whaddayacallit, Wikipedia tells me it's a G-clef. It's a pretty symbol, but I have no idea if it's inextricably linked to these Mercer songs or what. BEFOOL (39D: Hoodwink] looks kinda crazy. Haven't seen the word before—dictionary labels it "archaic." Company calls—will return to the blog Sunday morning. Henry Hook's Boston Globe crossword, "Decimation"
Well, I guess I don't really need to blog this puzzle since its constructor explained the theme in the comments before I'd done the puzzle. Spoiler! Spoiler! So, filling in the puzzle was just a rote process, no brain work to decipher the theme. 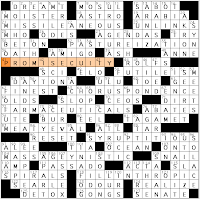 The clues are words in all caps, and if you insert TEN, you get another word, and that word clues the theme answer in sort of a clue/answer reverse: [BAR(TEN)D?] = SERVE DRINKS, [CHAS(TEN)ER?] = ONE WHO PUNISHES, [HEAR(TEN)S?] = ENCOURAGES, [LA(TEN)CY?] = DORMANT STATE, [S(TEN)O?] = SHORTHAND WRITER, [SHOR(TEN)ING?] = LARD OR BUTTER, [AN(TEN)NA?] = RABBIT EARS, and [PAN(TEN)E] = BRAND OF SHAMPOO. You DIVIDE each clue word by TEN by inserting TEN into it. I think I would've liked the theme a lot if I'd had to puzzle through it myself. 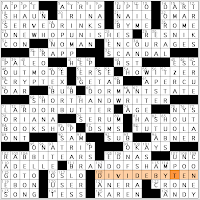 Merl Reagle's syndicated crossword, "Homophone Sylables"
• 21A. MISSILEANEOUS (miscellaneous) might be a [Category the Pentagon uses instead of "other"?]. • 32A. [Process of growing grass for cows?] could be called PASTUREIZATION (pasteurization). • 41A. PROMISECUITY (promiscuity) is clued as [Habit of giving your word to everybody but never keeping it?]. Brilliant. We should adopt this as a useful term. The English language could use a single word to describe this concept. • 50A. FUTILEISM (feudalism) is the [Social system under which nothing ever gets better?]. • 63A. CHORUSPONDENCE (correspondence) is [The fan mail that backup singers get?]. • 72A. [Organically grown herbal medicines?] are FARMACEUTICALS (pharmaceuticals). • 83A. [Of an age when pork and mutton were pretty much all you ate?] is MEATYEVAL (medieval). • 104A. MASSAGEYNISTIC (misogynistic) is clued [Contemptuous of rubdowns done by women?]. • 118A. FILL-IN-THROPIC (philanthropic) is [Pertaining to puzzle events that benefit charities?]. • 27A. [Self-serving aims, often] are AGENDAS. • 58A. [Knife for Nanook] is an ULU. • 111A. PASSADO is a [Thrusting move, in fencing]. I don't recognize the word, even though we did some fencing in high school gym class. • 112A. [Ludacris song, "___ Fool"] clues the two-word partial phrase ACT A. Nobody loves partials, but this is fresher than clueing the word ACTA. • 1D. [Auctioneer's query] is "DO I HEAR [some random dollar amount]?" • 10D. ["Well, you go ___ and I'll go mine" (Groucho)] clues URUGUAY, Groucho's pun on "your way." • 20D. [Rubber hub] is rubber manufacturing city AKRON, Ohio. • 28D. [P.M. whose jacket caught on] is NEHRU. The NEHRU jacket is, well, not a fashion I've ever worn, but it's had its day. • 50D. Holy cats, really? FUSEL is today's out-there, uncommon answer. [Fermentation product, ___ oil] is not a clue that helped me get the answer. No clue would. 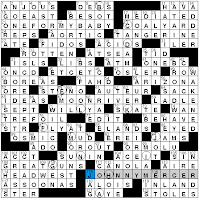 Mike Torch's syndicated Los Angeles Times crossword, "Ling-uistics"
For me, this is today's most challenging 21x21 crossword. The theme involves adding -LING to the end of a word to alter its meaning, and the results are pretty good. I like it when theme entries aren't completely obvious and you have a bunch of "aha" moments when you piece them together. The Gorski NYT's theme didn't offer me any of these "ahas," with the "aha" reserved for the connect-the-dots visual aspect. Hook's Globe puzzle would've given me a big "aha" with some oomph to it if I hadn't known the theme up front. And Reagle's puzzle, like Torch's, had a solid "aha"/amusement payoff for each theme answer. • 24A. STARLING TREK could be a [Migration of gregarious birds?]. • 50A. The Ox-Bow Incident is a novel and movie. OX BOWLING INCIDENT is a [Bovine argument at the lanes?]. This one made me laugh. There were no oxen present when I went bowling last week, luckily. • 71A. [Game for lazy kids?] is IDLING TAG. • 95A. Can I pick your brain? PICKLING YOUR BRAIN is [Drinking too much?]. • 122A. LEGAL FEELING is a [Courtroom intuition?]. • 3D. [Result of way too much praise?] is EGO TRIPLING. • 31D. RED INKLING plays on red ink, and is clued as a Joseph [McCarthy suspicion?]. I like this one a lot too. • 58D. This clue could've gone down the vomiting lane, but it didn't. BEN HURLING is [Affleck on the mound? "], hurling a baseball. It would've been really impressive if Torch had built the entire theme around movie titles + LING—24A and 50A join with this one in the movie category. • 74D. The Fab Four become FABLING FOUR, a [Quartet of storytellers?]. Least familiar answer in the grid: 110D: TROON is a [Town on the Firth of Clyde]. Overall, the fill is pretty smooth. I'll dock it one point for having both UNO and UNI, but at least they're small and on opposite sides of the grid. Doug Peterson's Washington Post/CrosSynergy "Sunday Challenge"
• 15A. A BROMANCE is an [Intimate friendship between two guys, slangily]. Near the end of Superbad, which I watched again last night, there's a sweet moment between Michael Cera and Jonah Hill's characters, in the fine tradition of the bromance. • 8D. "HERE GOES NOTHING" is clued with ["This probably won't work..."]. • 12D. ALGORITHMS is just a cool word, so different from the rest of the English language. They're [Step-by-step procedures]. • 27D. At the Crate & Barrel Outlet on Friday, I passed up the chance to buy a FLY SWATTER, or [Inexpensive extermination device]. • 46A. HATCHET MEN are [Enforcers for the mob], among other things. • 16A. UVULAR means [Sounded from the back of the throat]. • 41A. TOMSK is a [Siberian city]. We see OMSK much more often in the puzzle than TOMSK. • 2D. URDU is related to the Hindi language, so it's a [Hindi relative] but not a Hindi word for a family member. • 21D. GALOPS are [Lively dances]. The word's related to "gallop." It took a little longer than usual to figure out how the first rows were laid out. 1A SCHISM, 11A CRULLER, and 14A DEADLY SINS were stacked together, but was the 7A CLAM, 13A HAHA, 17A AVON stack to the right of the bigger stack (with 1A and 7A on the top line), or was it to the right (with a bunch of black squares to the left of 1A and above 7A)? Turns out to be the latter. I didn't piece it together until the end of 21A DAYS IN A WEEK, in the fifth row, hooked up with some Down answers and showed me the way. It was LITTLE FOYS that killed me. The Seven Little Foys is a 1955 Bob Hope movie that was nominated for a screenplay Oscar, but I've not only never seen the movie, I've scarcely even heard of it. The O crossed a partial that I had trouble piecing together: 59A ["___ of You" (Hank Williams Jr. album)] clues I'M ONE of you. I pondered "I Mane of You," "Imene of You," "I, Mine, of You," and "Imune of You" for the vowels, and IMLNE and IMRNE for FRYS and FLYS. Gah. I was slightly thrown by the dated word SLOVEN, 20A [Neatnik's opposite]. It's a dated word, much less familiar than "slovenly." I'm not telling my husband that this word, meaning "a person who is habitually messy or careless," exists.